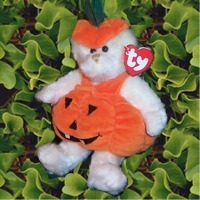 Carver, the adorable pumpkin bear, was released just in time for Halloween. Carver's style number is 6271. 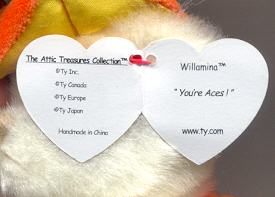 However, two Carver oddities were found with a Willamina hang tag and a tag line of "You're Aces!" What makes this an interesting oddity is Willamina's style number 6227, which suggests that this particular Attic Treasure will never be released. Her style number falls between Armstrong and Marigold which were released in June of 2000. The style numbers of yesterday's four announced Attics fall between 6283-6286, so it is unlikely that Ty will go back and use the style number 6227. Secondly, it has the "TM" rather than the "R" after "The Attic Treasure Collection," which was a recent change. And third, the tags have the old style on the back. 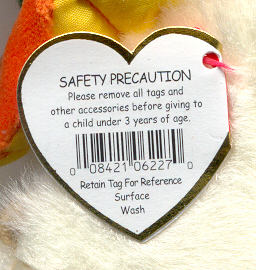 For a look at all the versions of the seventh generation hang tags click here. Another twist is that to date only two Willamina hang tags have been found, one of which is the U.S. version, and the other the European version. Jim of Montana has been kind enough to share a scan of his lucky find of the European version shown to the right. The U.S, version was found by Sue of Virginia. For a listing of unused style numbers Click Here.